The agreements between the Likud, Bayit Yehudi and Yesh Atid are expected to be placed on the Knesset table before the end of the day. 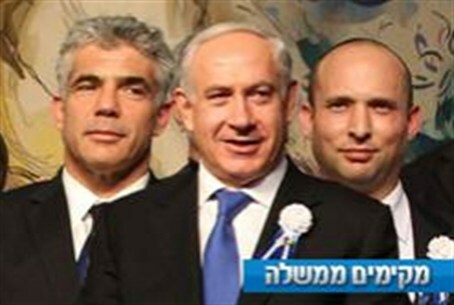 The coalition agreements between the Likud/Yisrael Beytenu and the Yesh Atid and Bayit Yehudi parties are expected to be placed on the Knesset table before the end of the day on Thursday. The negotiating teams of the three parties met late on Wednesday night to work out the wording of the agreements. Later on Thursday the members of the Bayit Yehudi are expected to gather to approve the signed agreements. The Likud party members are also expected to hold a meeting during the day to decide on the distribution of the ministerial portfolios within the party. The meeting is expected to be particularly difficult for Prime Minister Binyamin Netanyahu, who has been left with only seven ministerial portfolios for the Likud. Criticism of Netanyahu among the Likud members was voiced already on Wednesday night. A deadlock over the formation of the government was broken on Wednesday evening, after the Likud conceded the Education Ministry to Yesh Atid. Earlier in the day, Netanyahu warned Lapid that time has run out, and that if Lapid could not find a way to compromise on his “excessive demands,” then Netanyahu would approach the hareidi-religious parties instead to negotiate their entry into the coalition. The coalition agreement appears to be a great achievement for the Religious Zionist movement, especially with Uri Ariel being appointed as Housing Minister. Ariel’s appointment should be very good news for residents of Judea, Samaria and Jerusalem, because he is unlikely to cooperate with any scheme for housing freezes in these areas, and will likely make every effort to increase construction there. The opposition parties, meanwhile, predicted that the new government would not last long.